Kunzea pomifera is also known as Muntries, this is a prostrate form although some plants are more upright that others. Used as a bush tucker food as well as for making jams, with the mauve to purple berries having a sweet spicy taste. Used as a bush food for 100s of years. Traditionally the fruit was eaten fresh, or dried and stored for use later. This low growing plant is fast becoming a popular food source, high in antioxidants , Muntries are now widely used in jams as well as desserts. reaching only around 30cm in height Kunzia pomifera is also useful as a ground cover plant, the flowers appear in late spring to summer and are fragrant. The berries do differ with the darker colored ones being sweeter. 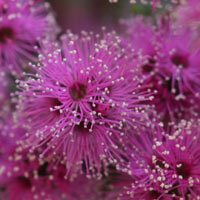 Found in both South Australia and Victoria its dense habit makes it suitable for mass planting and an excellent choice for gentle slopes and embankments. The flowers in spring attract birds and insects. However it is for the small berries (Muntries) that appear after the flower in mid summer that this plant is becoming popular. A well drained soil is essential as is full sun. New plants should receive a little extra water and some protection from full sun through the first summer. Propagation is best from semi hardwood cuttings. This is also a plant that resents root disturbance, it is best planted and then mulched around to prevent weeds. A little extra water through dry summers is beneficial for growth .However over watering can cause root problems as well as dilute the sweetness flavor of the berries. The plant will spread as it naturally layers from the the branches that touch the ground. Some grafted plants are also available, usually on K.ericoides or K.ambigua rootstock which have a more upright habit. Commercial growers use a low trellis to lift the plant off the ground a little. This seems to improve fruit production. A position in full sun to part shade..